Badam-chaki, a favorite Bengali candy, is made from peanuts and sugar. It’s known as badam-chikki in northern India and peanut brittle in the western world. There are many recipe variations for making badam chaki. We made ours particularly healthy with almonds (or kagchi badam in Bengali) and without butter to minimize the fat content. Even without the butter it turned out great! You will also need parchment paper or non-stick aluminium sheet, a cookie sheet and a candy thermometer. 1. Spread the parchment paper on a cookie sheet. Keep it close to the oven so when the sugar melts, i’s immediately available. 2. We used roasted almonds. If you have unroasted almonds, roast them on a hot pan, then set aside. 3. In a heavy bottomed or nonstick pan add the sugar, vanilla, water, corn syrup. 4. Then, turn on the stove to medium hot and start stirring the sugar. Continue stirring until the sugar melts. It will take about fifteen to twenty minutes depending on the stove’s temperature. 5. As soon as the sugar melts, put a candy thermometer in the molten sugar. When the temperature reaches 280 degrees, immediately turn off the stove. It is important that you turn it off immediately otherwise the residual heat will increase the temperature and burn the sugar. 6. Add the baking soda and stir. The baking soda will start foaming. At this point remove the thermometer. 7. 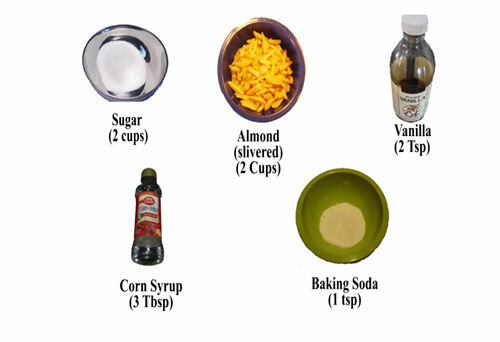 Add the almonds while stirring constantly so that the molten sugar coats all of the almonds. 8. Immediately pour the mixture on the parchment paper and then spread it around before the sugar solidifies. 9. Set aside to cool down to room temperature. 10. Then remove the parchment paper and set it on a smooth surface. 11. You can break it by putting directly in the middle. Or you make a scratch mark with a serrated knife and break it. Break it to desired size. Save it in a closed container for storage and use it as desired.